When I lived in England, I was lucky enough to have a Damson plum tree in our yard. The year it gave us a good-sized crop, I made jam using this recipe. Be careful not to overcook the jam--all the pectin in the plums results in a quickly setting jam. I also left the pits in, just as Edna Lewis recommends, even though they could be slightly annoying to pick out of the jars. I wonder if anyone who makes jam can conform the pits add noticeable flavor if left in the jar. Anyone?!? My husband really liked this, and I gave it 4 stars (1995). My cobbler took only about 20 minutes versus the 35 minutes after the heat is lowered to 425F. Do put an old sheet pan underneath to catch drips from the bubbling cobbler. My notes from 1995 say "Interesting, good". Will have to revisit this out of curiosity! I made this to accompany the Fresh Peach Cobbler from this cookbook. 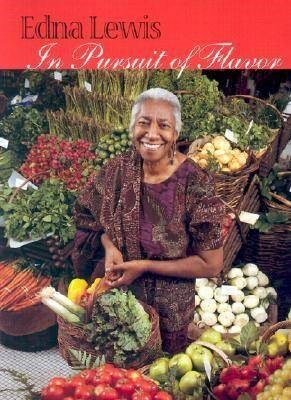 Perhaps no other cook has played such a central role in the renaissance of traditional Southern cooking as Edna Lewis. When asked who has influenced them most, chefs from New York to Little Washington to Charleston cite Ms. Lewis and her classic collection of recipes, In Pursuit of Flavor, first published in 1988. Edna Lewis learned to cook by watching her mother prepare food in their kitchen in a small farming community in Virginia. Because she was raised at a time when the vegetables came from the garden, fruit from the orchard, pickles, relishes, chutney, and jellies from quick canning, and meat from the smokehouse, Edna Lewis knows how food should taste. Every recipe included in her cookbook, both old friends and new discoveries, reflects her memory of and continuing search for good flavor. In chapters devoted to fruits and vegetables, meat and fowl, fish, herbs and spices, bread, and other baked goods, Ms. Lewis shares her secrets for getting the best out of food: combining tomatoes with cymling squash, pumpkins with onion and bacon, cooking sweet potatoes with lemon, and boiling corn in its husk. She always keeps a bit of country ham around to perk up greens, cooks fish fillets or chicken breasts in parchment, and braises meat in a clay pot to keep it moist. Her baking recipes, for the griddle and the oven, include tips on the right flour to use, how to make your own baking powder (to avoid the chemical taste), how to listen for signs that a cake is done, and when to use frozen butter in a pie crust and when to use pure leaf lard. In Pursuit of Flavor brings generations of cooking wisdom to today's kitchen. Edna Lewis was born in Freetown, Orange County, Virginia, in a community founded by her grandfather and his friends shortly after their emancipation from slavery. She most recently lived in Atlanta, Georgia until her death at age 89 on February 13, 2006. In 2003 Edna Lewis was inducted into the KitchenAid Cookbook Hall of Fame for her lifetime of achievements in the culinary industry.